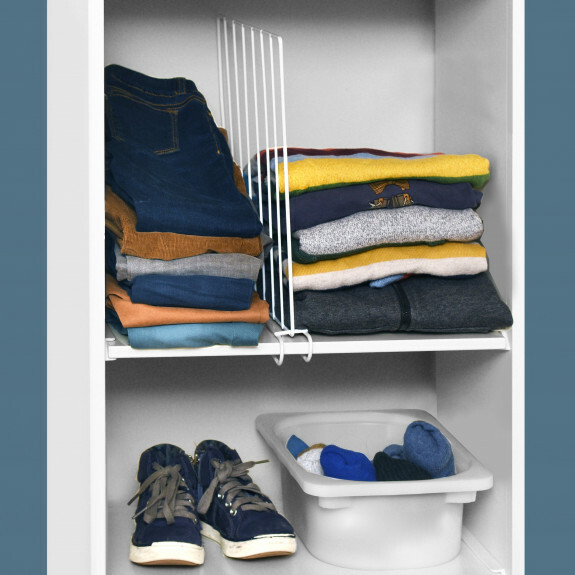 ORGANIZING MADE EASY: Streamline and organize closets by creating separated sections for sweaters, shirts, pants, jeans, yoga pants, athletic wear, blankets, purses, baseball hats and other accessories; Save time and reduce clutter by keeping things neat and tidy. SIMPLE INSTALLATION: Each divider easily installs with no hardware or tools needed; Simply slide the divider over closet shelves up to 1 inch thick to create individual compartments. Dividers will give you the ability to easily stack items such as clothing, towels, blankets, and linens into neat, high piles, increasing storage space. Separate shoes, purses, and bags on the same shelf. Dividers can be easily moved or removed when reorganizing, with no damage to shelves. QUALITY CONSTRUCTION: Made from sturdy steel wire Wipe clean with damp cloth. THE YBM HOME SHELF DIVIDERS WILL BRING AN END TO CLOSET CLUTTER. Quit searching for your T-shirts, towels, purses, sweaters, linens or handbags every time! Our value pack of four steel shelf dividers will help you organize your closet, creating extra space while making sure that every item is easily accessible! OUR SHELF SEPERATORS HAVE A PERFECT FITTING WITH A GOOD GRIP. Our shelf dividers require no assembly! It simply slides easily onto thick Standard Sized Shelves via the innovative slide design which keeps it firm and securely in place. Good grip ensures they stand up straight without wobbling once installed! Shelves could be upto 1 inch thick. THESE SHELF DIVIDERS FOR CLOSETS ARE SUITABLE FOR ALL KINDS OF SCENES. USE THESE SHELF DIVIDERS FOR KITCHEN CABINETS. Divide your kitchen cabinet into different functional areas, such as condiment areas, food storage areas, etc. Save the time and hassle of searching through cabinets for desired ingredients and products. THESE SHELF DIVIDERS COULD ALSO BE USED FOR BOOKSHELVES. A lot of files and books messy piled together in your study room or office makes you not find what you are looking for. Don't worry, separate them with our wire steel dividers. Keep the same type of things in one area and you will no longer have to search for them all over. THESE DIVIDERS ARE THE SECRET BEHIND A WELL ORGANIZED CLOSET . These shelf dividers will definitely make your closet neat, separated and well-organized. Your face will light up with smiles each time you open your closet and find everything in neat piles!